Actual: 151.0 mm, Normal: 234.7 mm and Departure: -36%. 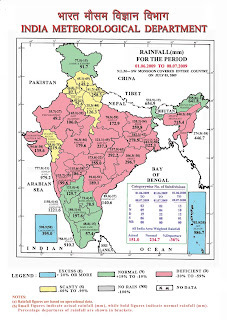 This is the position of the monsoon deficiency as on 8th. July. Much is being talked about the poor rainfall, and the scanty conditions Surely is a cause for concern. The map shows the all India position. Broadly speaking, the south is now normal, and the rest of the country, west, east, north and central still" below." The overall Negative has come down, from the last figure in my blog of last week, from -56% to -36%. Now, continuing from the last blog, the sequence of events seems to be taking shape. I reproduce a paragraph from my prevoius blog, just to continue from there-:" But for north Konkan, and Mumbai,the inflow of substantial moisture bearing rain clouds could start "rushing into" the coastal regions from Wednessday evening itself. Heavy rains could once again start in from Wednesday /Thursday , and could, as a result of the system moving westwards,continue for the next 4/5 days.." Holds true today also. The land based low h as moved west from Jharkhand, and the rains in the mentioned regions have commenced. The IMD streamline map (of 10th.) shows the monsoon trough also sliding south. The trough is now the "line" joining the 3 lows from Sindh to south rajasthan to West Bengal. And aptly demonstrated by the easterlies above the trough. Now as discussed, these easterlies must bring in the moisture to the northern belt. But, only after the 2nd. projected low forms in the bay around the 12th. Now, 2 lows are awaited. 1 in the bay, and 1 in the northern Arabian Sea. Both predicted to appear around the 12th. On this happening, the full course of the rain path mentioned my blog dated 7th. could materialise. Only one important change has occured (not occured). The Arabian Sea low may not become into a deprssion and head towards Oman as mentioned and projected. (I am sorry to make frequent referances to my blog of 7th. But, this write up is almost like a continuation). So, let us hope, and pray, that these 2 weather systems do form, and bring the much required rains in central/northern/western regions of the country. In the absence of rains in the initial week of July, the temperatures in Gujarat, Rajasthan, Punjab,Delhi and Sindh regions shot up to markedly above normal figures. Ahmadabad had an all time high for July, recording 42.8c on the 4th. The days were at 43-44c in Rajasthan, and the night temperature in Bikaner was 33c. Also, 49c at Sibbi, was the highest across the border yesteday. Due to this heatwave, isolated pockets in Gujarat recieved extremely heavy convective rains in the week. Unofficial reports from Bharuch mention of 82 mms of rain in 55 minutes on the 2nd, with a wind speed of 120 Kmph ! Baroda got 110 mms in 1 hr. 30 mins with strong gusty winds. Thanks for the update, so how does it look for Mumbai, it has definetly begun to look like a 'normal' July for Mumbai with rains (some heavy) every day now. 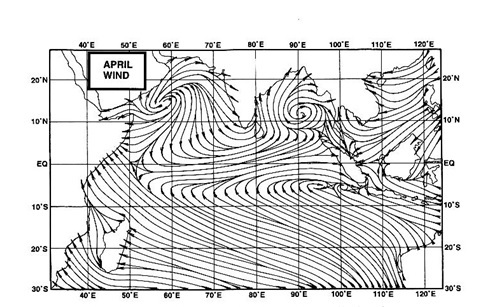 Where is the Arabian Sea Low likely to form (in reference to Mumbai) and which way is it going to be headed?